Specialist Isiah Booker, age 23, a member of 2nd Battalion, 5th Special Forces Group based at Fort Campbell, Kentucky, died in Jordan on January 7, 2017 in a non-combat related incident. He was supporting Operation Inherent Resolve – the fight against the Islamic State in Syria and Iraq. Isiah L. Booker was from Cibolo, Texas prior to joining the service. 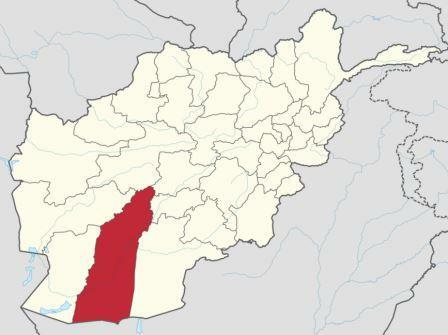 He was killed while operating construction equipment. Booker was a cook assigned to the SF group and was on his second deployment. 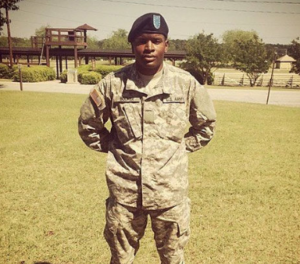 He enlisted in the Army in 2014 and completed basic training at Fort Jackson, South Carolina. He earned five Army Achievement Medals, the Global War on Terrorism Service Medal, the Parachutist Badge, and other awards. See “DoD indentifies soldier killed in non-combat related incident in Jordan”, Army Times, January 9, 2017. 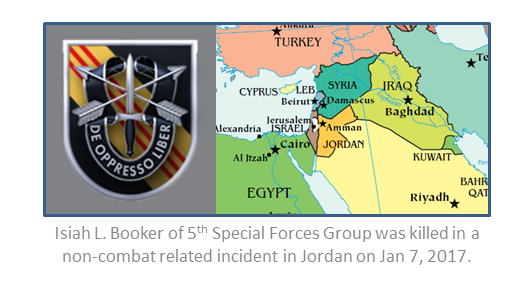 Read “Special Forces cooked killed in Jordan was on second deployment”, Army Times, January 9, 2017. Jan 8, DoD Identifies Army Casualty, DoD News Release. Jan 12, 2017, 5th SFG Soldier dies in Jordan, The Fort Campbell Courier.